Thankfully, thanksgiving is next week and I’ll be able to go home and exchange my light winter coat for my heavy winter coat. The semester is weeks away from being over, and I have officially had to retire my flip flops. Luckily, we still have memories of summer to sustain us through the winter months. I thought it’d be fun to follow up with the “what are YOU doing this summer?” post from last spring and show you a few friends in action during Summer ’09. Ariadne Smith '10 (course 2) in Paris, where she interned at Electricite de France. Sam O'Keefe '09 (course 1) in front of the Roman Aqueducts ("you can smell the engineering"-Sam). Sam participated in Misti Spain and interned at a Renewable Energy Policy Lobby in Madrid. Emily Onufer '10 (course 20) interned at St. Jude Medical Devices -a company specializing in cardiac medical technology, in Minneapolis, MN. What does being green mean to teens? MIT students mentored local youth over the summer to pose that very question to teens nationwide and produce an hour-long radio program about their findings. The work was part of Terrascope Youth Radio (TYR), a teen outreach program run as a collaboration between the MIT Terrascope Program and the City of Cambridge Youth Programs. TYR is radio about big issues and everyday stories, such as how to be more environmentally conscious in your own home. The program, called Fresh Greens: Teens and the Environment, will be broadcast and distributed by New Hampshire Public Radio (and streamed on NHPR.org) on Friday, Sept. 4, at noon and Saturday, Sept. 5, at 4:00 p.m. You can also listen to clips online. The answers teens gave about their views on environmental issues might surprise you. Kids say being green is not merely remembering to recycle. It’s about listening to the experience and wisdom of others and believing one person can make a difference, then spreading the word. The program is hosted by two TYR members, Hichem Hadjeres and Manon Bonnet, and youth radio groups across the country submitted pieces for inclusion in the special. TYR interns—most of whom had no previous radio experience before the five-week program—helped select and edit the pieces, write the script, choose music, and mix the program. Ever Wish a Photo Could Capture a Scent? Sorry to disappoint – I have not created a photograph that can capture a scent, nor do I know an MIT alum who has done such a thing. I did, however, wish for such a thing last night, as I walked through the North End and a fresh air + salt water + olive oil + tomato sauce and wine aroma floated through the humid air. I’ve been most exposed to these perfect sensory experiences on family vacations growing up, so I spent the whole first fifteen minutes of walking down Hanover repeatedly exclaiming, “I feel like I’m on vacation!” Truthfully, I often feel like I’m on vacation when I’m in Boston (i.e., all the time). Can you tell I’m from a small town? Anyway, a few friends and I dined at G’Vanni’s last night. Two friends in particular almost had heart attacks after seeing one of their professors eating dinner with her husband. We thought professors ceased to exist outside of class? I’m also including a picture from last year, when a group of us were driving home from dinner near the North End and literally turned the car around to jump around in water. I’m interested to know if those of you who stayed in Boston during the summer spent your time on these same sorts of excursions? That is, all of the touristy things that there is little time to do during the school year. Do tell! Fireworks, Friends, Freedom & Cupcakes! Hi everyone! Whew – it has been quite an academically busy summer for me, but I won’t bore you with those details. Instead I thought you’d enjoy a recap of my third Fourth of July at MIT. On the eve of Independance Day, I made cupcakes in my friend’s kitchen in Bexley. (I decided to personalize some of the cupcakes (exhibit to your right) for a BBQ we had the next day.) Artistic genius? I think yes. I spent some of the early evening on the 4th at the Baker Alumni Reunion BBQ to fulfill my duties as a student ambassador/bakerite/ MIT student who knows she will be an alum all too soon, too! What was 7/4 like when you were at MIT? Have you been back since and has it changed? Rachel ’09, Jon ’11, and me! Henley Veteran Regatta: Alumni Team Rows Today! July 8 practice at the Reading Rowing Club boathouse. 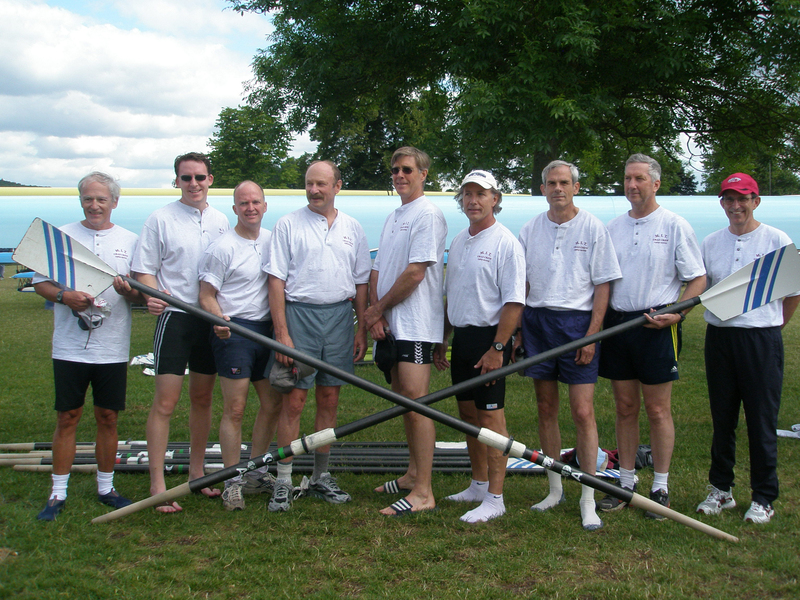 From left to right ( from bow to stern, then coxswain): Chuck Roth ‘66, Robert Lentz ‘98, John Malarkey ‘71, W. David Lee ‘69, Dusty Ordway ‘73, Bruce N. Anderson ‘69, Bruce Parker ‘69, Don Saer ‘70, and Willie Vicens ‘70. A shell and oars are the competitive tools that a nine-member alumni crew will use in the UK’s Henley Veteran Regatta–some for the fourth time. 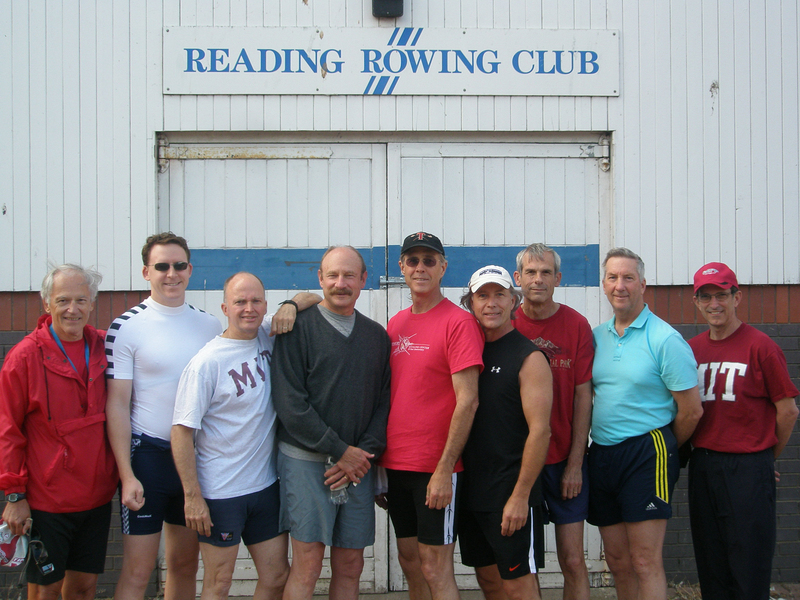 Nearly the same crew represented MIT at Henley 40 years ago. They compete today, July 10, and if they win, they compete tomorrow as well. Check the results of their E8 event online. The Henley Veteran Regatta, hosted at Upper Thames, is an internationally recognized event for veterans or masters crews, held on the weekend following the Henley Royal Regatta. The crew after losing to Durham Boat Club (England) July 10. MIT’s connection to the regatta began even earlier. Read an archived Technology Review article that describes the 1954 and 1955 results when two MIT lightweight crews won back-to-back international championships. Update July 13 Alas, our guys lost. “We raced a fine and fast race but they were finer and faster,” says Anderson. I first met Josh Schuler when I was a senior in high school. I was my state’s female delegate at the American Junior Academy of Science’s annual convention (held with the AAAS’s annual convention) in St. Louis. It was an absolutely incredible experience and I loved every second of it. On one particular morning, we had a Breakfast With the Scientists event and I sat down next to Josh, who is now the Executive Director of the Lemelson-MIT program. At the time, he worked as Inventeams Grants Officer, awarding ingenious high school students with grants for their invention ideas. Josh asked me to stop by Eurekafest last week: an event which partly showcases the high school students’ and their inventions. In case you couldn’t be there, I decided to bring some of the ingenuity to you! Also to our right is an invention which hopes to one day improve highway safety: the Cooperative Cruise Control for Hybrid Commuter Cars from students in Palos Verdes Estates, California. More years passed than I care to acknowledge before the practice of perching on a shopping cart and zooming through the grocery store got old. In fact, it never got that old. Not to me, and evidently, not to these MIT students. According to gadget blog Gizmodo, a group of MIT students recently fashioned a go-kart out of a shopping cart using a stack of NiCd aircraft batteries, a 15hp brushless motor, and some new wheels. The best (read: scariest) part? It can reach 45 miles per hour.